Diet pills that bind fat or fat binders are one of the most effective diet products available to the consumer from the over the counter market. Walk into Holland & Barrett, Boots the Chemist, Superdrug or any leading supermarket chain and you will be sure to find the familiar blue packet of Lipobind. Lipobind is generally accepted as being the Best Selling Slimming Tablet In The UK – best selling though does not necessarily equate to best product! We have put Lipobind up against another popular fat binder Proactol – both Lipobind and Proactol are pretty much head and shoulders above other non prescription fat binders. A dietary fat binder that can prevent the absorption of fat. It is sold in major retail outlets and very heavily marketed. Works in much the same way as Lipobind by preventing fat absorption. Available only direct via the official website. 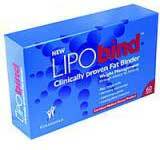 Lipobind has several celebrity endorsements. Former EastEnder Lucy Benjamin and TV presenter Katy Hill. Katy reportedly lost 10lbs after gaining weight as a result of the birth of her daughter. Proactol has several real life success stories. The Daily Express featured Laura Price who reportedly shed 6 dress sizes. An independent survey undertaken by the Telegraph voted Proactol one of the best ways to lose weight 2008 and the following year in 2009..
Proactol has numerous endorsements from the medical community. Both products are produced from reputable companies. The overall conclusion that can be drawn here is that although Lipobind is the leading brand and the best selling – Proactol has several features that places it slightly above. 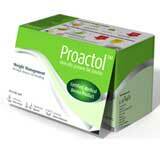 Proactol is cheaper pretty much across the board in single packages and quantity purchases. Lipobind has the marketing budget and commercial presence but for how long! Lipobind can be purchased from many different outlets whereas Proactol is only available via its official website. Proactol has the advantage over Lipobind.